I love this time of year when all the winter coats start to come into the shops. I especially adore all the cooler weather shades like burgundy (as you can tell from my post here). This coat is so classy with the detailed buttons and the small fur collar. The Alannah Hill coats are always so warm and beautiful quality. Unfortunately there will have to be a rather significant sale for me to add this coat to my collection as it retails at $529, and I did buy a few too many coats last season. But I will remain hopeful. This beautiful shade of burgundy/rouge noir, maroon, wine etc. (or whatever one wishes to call it) is currently my favourite colour. It is so classy and pretty and I’m constantly drawn to pieces in this shade. 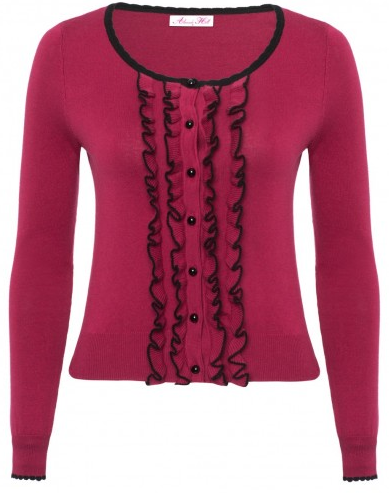 There are many pieces in Alannah Hill at the moment in this colour, especially cardigans, and I want them all! I don’t purchase as much from Alannah Hill as I used to given that my Kitten D’Amour obsession has taken over but I had a look in AH the other day and it’s all coming back to my. I think my next shopping trip will be there instead of Kitten. I’m sure you’re all able to understand my love for B.A.I.T Footwear after seeing my post here. Despite having the Robbie style in three colours already, I really want to add the cream version to my collection (also wish I could have the gold pair and the silver pair but there’s no way in a million years I’d buy the same pair of shoes in six colours). The cream pair would be extremely versatile and go with so many outfits which I avoid pairing with the black version. They are also patent which is always a preference; some of the newer colours in the Robbie appear to be more matte such as the red pair. 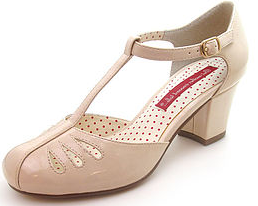 Another reason I want these shoes is because they remind me of one of my favourite pairs of shoes which I purchased from Modcloth many years ago. They wore out and, despite my best efforts, I could never find them again to repurchase. I don’t have too many hair accessories from Kitten D’Amour as some of them can be a little OTT, even for me. However, others are very beautiful and this is one is absolutely perfect. The red and cameo is a very classic combination and velvet is my favourite ever material. 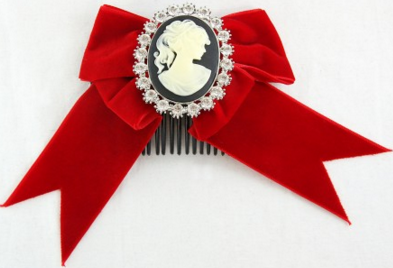 I especially love how it’s on a comb as I don’t see this too often and find these types of accessories much easier to use. 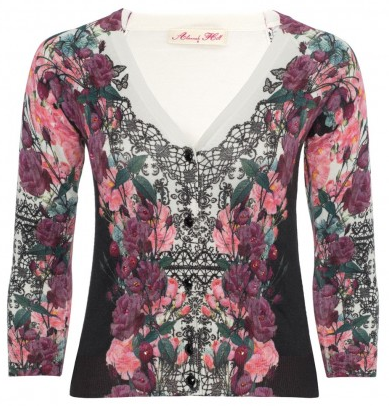 Another AH cardigan- see how much I love Alannah Hill right now? I love this one because it combines my favourite colours of pink and purple and the print is very unique. The addition of the black and white makes it even more pretty and classy. I’d like to try some pattern mixing with this lovely cardigan- florals and polka dots would be especially amazing. I like the dresses at Alannah Hill more than Kitten D’Amour at the moment (although that may have been because I’ve already purchased my favourites from Kitten). The AH dresses, at retail price, are well out of my price range which is unfortunate. This particular dress is currently on sale and I’ve had my eye on it for many months now. 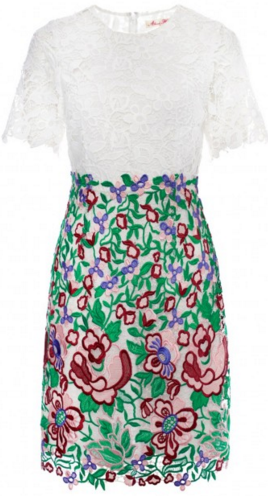 The lace detailing is extremely beautiful and the abstract floral design is super lovely. The two in one design, and the non-fit and flare silhouette, are different from my usual choices. What are your favourites at the moment? All these clothes are beautiful, but I really love those shoes! OMG that cameo bow! ❤ Love! Sweet picks!I can totally picture you in all of these. These are all items that totally fit your style and which I can all see you wearing! Beautiful pieces. 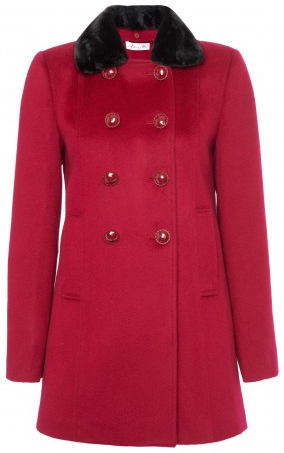 I adore the red coat! lovely picks! all of these items are so perfect for Spring. The Cream color of those Heels is just perfect for spring! Loving the red in those first two pieces, and great shoes. Love your picks! That coat is stunning. We are finally getting warmer weather over here, so I have a lot of summer stuff on my wishlist. In love with the red coat!!! I'm loving that last dress! So pretty! Oh, that lace dress is so pretty! Amazing place and cute dress! !